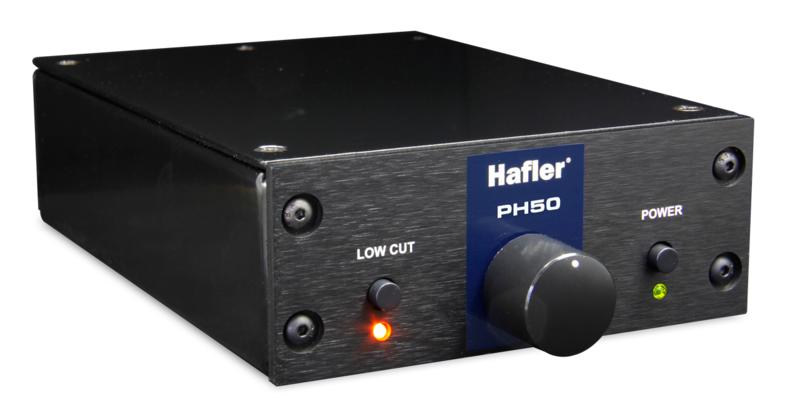 The Hafler PH60B is an exceptional phono preamp for moving coil (MC) cartridges, featuring both RCA and XLR outputs to allow for connection to high fidelity playback systems as well and pro audio recording interfaces and equipment. 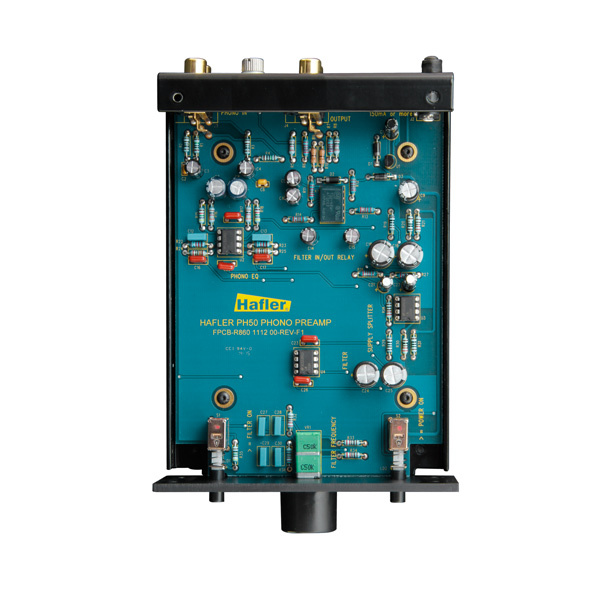 Beginning with a 100% discrete Class-A transformerless head-amp design, the PH60B circuit makes no compromises in audio quality, paying particular attention to reducing noise and distortion to absolute minimums. An exacting RIAA curve is applied to ensure the source material is reproduced as accurately as possible without coloration, and a 14-gauge steel housing shields against radio and magnetic interference. Gold-plated RCA inputs and outputs are provided to connect the PH60B between a turntable and a HIFI receiver. 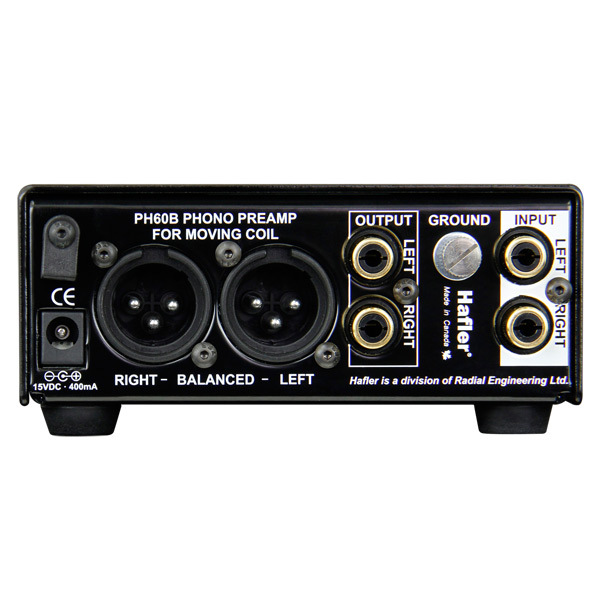 For connection to recording interfaces or pro audio playback systems, balanced XLR outputs are also provided. 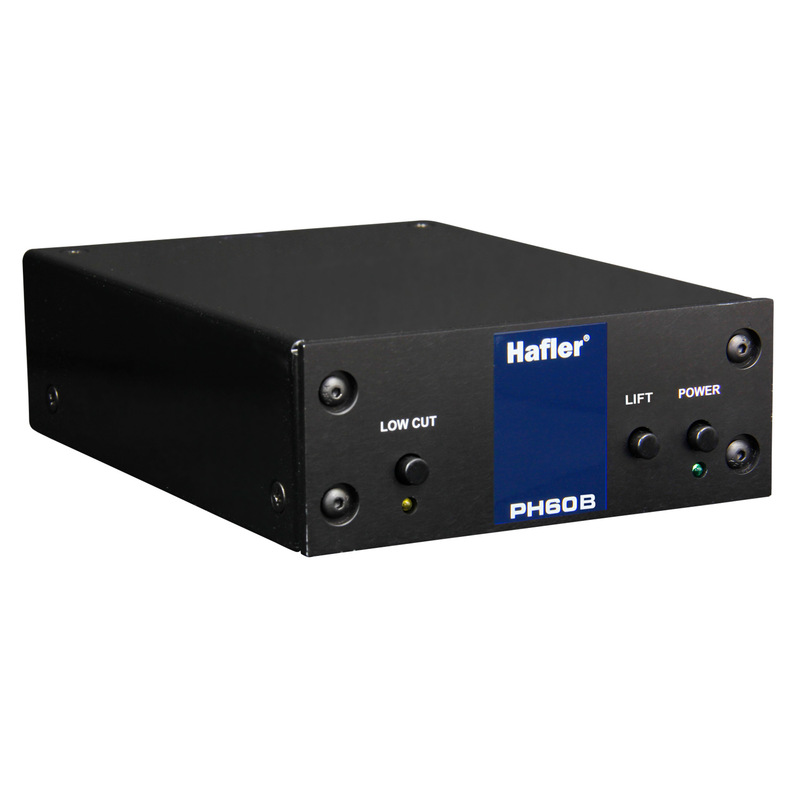 This allows the PH60B to be easily connected in the recording studio, or to facilitate conversion of a vinyl collection to a digital format when connected to a recording interface. The input impedance of the PH60B can be changed using a set of internal jumpers, allowing the optimal setting to be selected for the particular phono cartridge in use. These are set during the initial setup and can be changed later should one decide to change to a new moving coil cartridge. Front panel controls include a power on-off switch and a low cut rumble filter that may be inserted into the signal path when needed. This enables the user to reduce low frequencies that can cause resonance and feedback when playing music at higher levels. A ground lift switch is also available to help eliminate buzz and hum from ground loops when using the balanced XLR outputs. 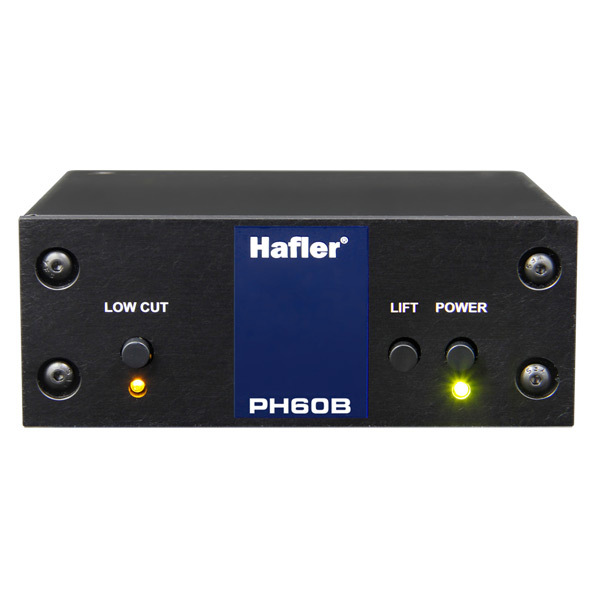 With incredible sound quality and the versatility to connect to both HIFI and pro audio equipment with ease, the PH60B continues the Hafler tradition of creating outstanding audio products. Connects from the turntable to the PH60B. Shipped with 100&ohm; input load for moving coil cartridges. Gold plated to eliminate tarnishing and ensure optimal signal transfer. Line level output connects to preamp or receivers' -10dB line input. Gold plated to eliminate tarnishing and ensure optimal signal transfer. Balanced XLR outputs allow for connection to pro audio systems and recording interfaces. Selectable between -10dB and +4dB using an internal push-switch. Standard round spade connector for the turntable ground attachment. Features knurled stainless steel thumbscrew for easy manipulation. Connection for the external 15V power supply. The all-important moving coil input section features a 100% discrete Class-A circuit to deliver an exceptionally linear response for the most demanding audiophile. The balanced outputs can be set between two different output levels. The default +4dB can be adjusted to -10dB with the switch pushed in. Ultra high quality switches and potentiometers employ steel casings and metal shafts for long-term reliability. 25, 50, 100Ω or custom load to set for your cartridge. Through-hole solder points combine with a military spec circuit board for greater durability. A full surface ground plane reduces susceptibility to radio frequency interference. Made from 14-gauge steel, the folded U-shape design provides a solid frame for sensitive PC board to eliminate torque, which could lead to solder joint failure. Also provides excellent shielding against RF and stray magnetic fields. Can I connect a moving magnet (MM) cartridge to the PH60B? No. The PH60B is designed for moving coil (MC) cartridges. For moving magnet designs, the Hafler PH50B is the proper choice. Can I connect the PH60B to the phono input on my receiver? No. 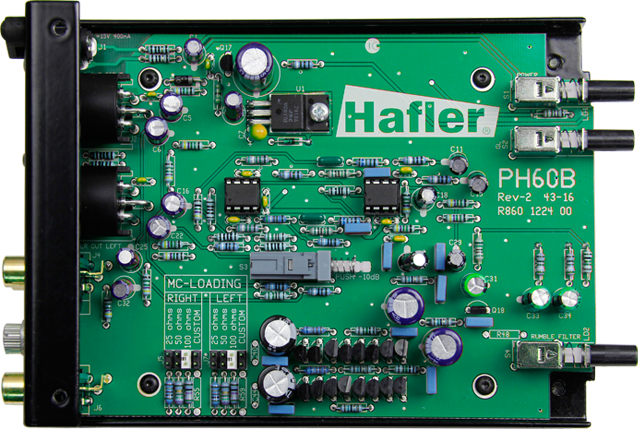 The phono stage on a receiver is equipped with an RIAA equalization curve, as is the PH60B. Using two of these EQs in series would seriously degrade the sound and the signal would likely be distorted due to the level mismatch. Can I bypass the RIAA equalization curve inside the PH60B? No. It is built into the PH60B and is part of the circuit board. Should I be concerned with the length of the cables I use? High impedance RCA cables are generally more prone to picking up noise from radio frequencies and magnetic fields. Thus keeping the cables shorter is beneficial. As a rule, try to keep the RCA output cables from the PH60B under 2 meters (6') in length. 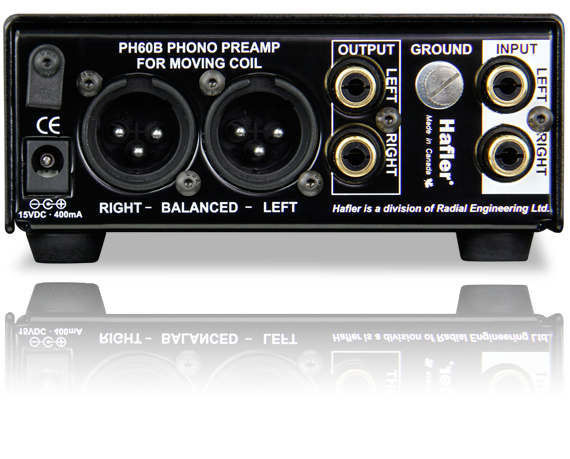 The balanced XLR outputs on the PH60B are designed to connect to the inputs of a recording interface or a pro audio playback system, with cables up to 100m (300') long. Can I connect the PH60B to my recording interface to transfer my albums? Absolutely, the balanced XLR outputs of the PH60B can be connected directly to the line level inputs of a recording interface, for easy digital transfer of your vinyl collection. 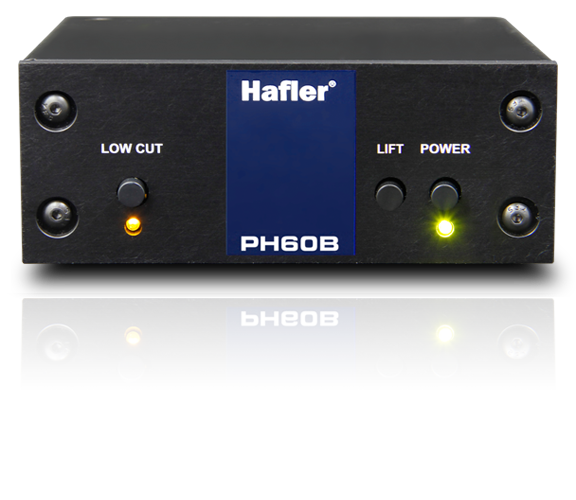 Why does the Hafler PH60B employ an external power supply? The low output from a turntable requires a lot of gain to bring it up to a suitable level. This also makes the circuit much more prone to noise. The transformer in a power supply generates hum which if not kept in check can generate noise. By moving the power supply outside the casing significantly reduces noise.